Ladies Group is Tuesday, January 9, 7:00pm We will be working on church scrapbook. If you have any supplies that might be useful. Also bring scissors. 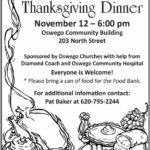 The Oswego Community Thanksgiving Dinner will be held Sunday, November 12 at 6 PM. The entire community is invited to this meal. This event is sponsored by the Oswego Churches with assistance from Diamond Coach and the Oswego Community Hospital. It will be held at the Oswego Community Center and attendees are invited to bring a canned food item for the Food Bank. It’s Official! Pastor Rick Qualls of Chanute, Kansas, will be our interim pastor starting Sunday, October 8, 2017. We want to invite everyone to join us for Sunday morning worship service at 10:40 AM. 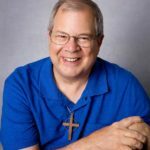 We also encourage you to check out the website featuring his book, Bright Spots in the Darkness. Pastor Rick, as well as his wife Nancy, will be a blessing to our church and to our community, so please join us Sunday morning.